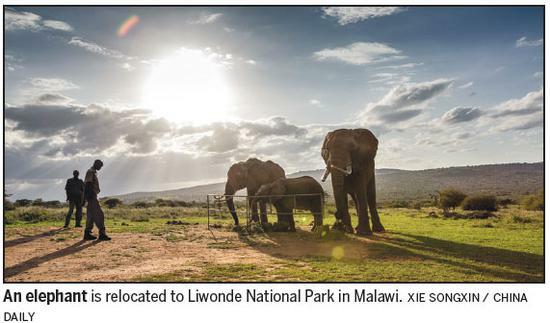 Brighton Kumchedwa, Malawi’s director of national parks and wildlife, has hailed the Chinese government, through its embassy in Malawi, for supporting the Southeast African country’s Stop Wildlife Crime campaign against the illegal poaching of wild animals. “When you look at the value chain of wildlife crime, it has supply (source), transit and demand sides. So if we are to deal with the crime holistically, it is important to deal with the demand side of things,” he says. “Malawi is both a source and transit state, while many Asian countries are consumer nations (on the demand side), so it will be a game-changer when source nations and consumer countries start to work together in this fight against wildlife crime,” Kumchedwa says. Another environmentalist, Godfrey Mfiti, also praises China for playing an active role in the protection of wildlife in Malawi. During the relaunch of the campaign on June 6 in the Malawian capital of Lilongwe, the charge d’affaires for the Chinese embassy, Wang Xiusheng, pledged his government’s full support for the initiative. “We wholly support the Malawi government in its efforts to protect its natural heritage. Visitors to Malawi must understand and abide by the laws, in that it is illegal to buy, sell or possess wildlife products without a licence, regardless of the value, and that these offenses will be treated as a serious crime,” Wang said. The Chinese government has demonstrated its commitment to the campaign by sponsoring displays at Kamuzu International Airport in Lilongwe and other borders posts. China has joined the governments of the United States, the United Kingdom and Germany in sponsoring the displays. The landlocked country of Malawi shares borders with Mozambique to the south and east, Zambia to the west and Tanzania to the north. The joint initiative in 2014, which involved the Department of National Parks and Wildlife and the Lilongwe Wildlife Trust, has been updated to publicize the new penalties for wildlife crime that were introduced in the Wildlife Act, amended in 2017. Under the revised regulations, offenders can be imprisoned for up to 30 years for illegal possession of wildlife products, and the regulations cover an additional 126 protected species. The species include plants, fungi, mammals, reptiles, amphibians, birds, fish and invertebrates. Elephant ivory, rhinoceros horn, hippopotamus teeth and live pangolin are often seized at airports in Malawi. Recently, the Convention on International Trade in Endangered Species identified Malawi as southern Africa’s principal transit hub for ivory trafficking. According to the Malawi government, 114 trafficking arrests were made in 2017 – an average of 9.5 per month versus 0.7 before the recent establishment of an investigation unit – and 125 traffickers, dealing primarily in ivory, were sentenced to prison. The Malawi government’s records indicate that sentences of up to 18 years in prison have already been passed by courts, where previously the average fine for wildlife crime was $40, with no custodial sentences passed between 2010 and 2015.